“Those that don’t got it, can’t show it. Those that got it, can’t hide it,” novelist Zora Neale Hurston famously quipped. “It” is that special something, that inimitable je ne sais quoi, the ineffable head turner than leaves people in awe. It’s more than mere beauty: it is the space where individuality meets a certain edgy grace. We describe it as “style,” a manner in which one’s appearance and actions meld into one that give shape to something that is as particular as it is pleasurable. Style can be of the times, or it can be far ahead, revealing itself years before the world is ready. With the benefit of hindsight, which books often bring, we can reflect back, in search of time past, amazed at the ways of former days are even more significant now. 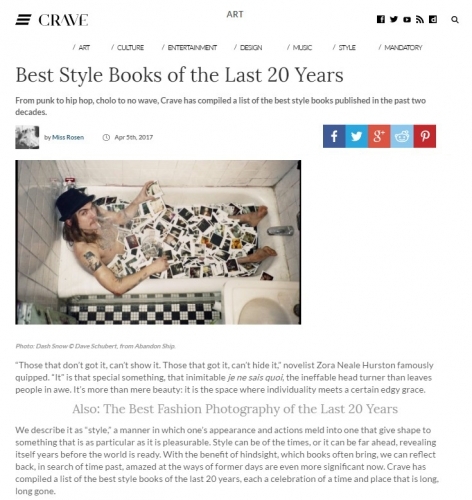 Crave has compiled a list of the best style books of the last 20 years, each a celebration of a time and place that is long, long gone.